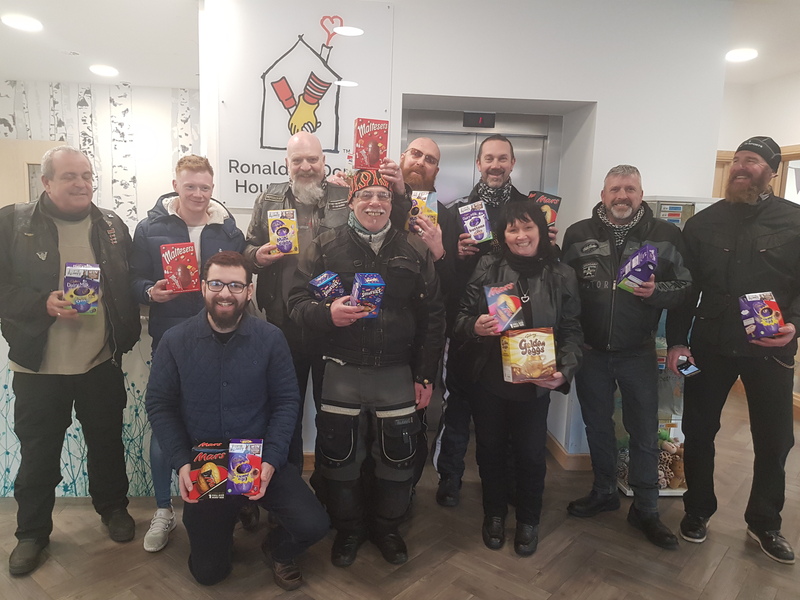 The bikers, Rogue Riders Riding Group South Wales, have donated a generous assortment of Easter eggs to the families of sick children staying at Ronald McDonald House Cardiff. On Saturday 24 March, ten riders from the group made their way from the Red Lion Pub at the Bonvilston car park to the House, next to Noah’s Ark Children’s Hospital. As well as Easter eggs, the Rogue Riders also donated toys and over £200 which they have raised through a variety of fundraising activities. The Ronald McDonald House Cardiff provides free ‘home away from home’ accommodation to families with seriously ill children in hospital. The motorcyclists wanted to ensure that the brothers and sisters of those in hospital over the Easter period could enjoy something positive during their stay. The Rogue Riders describe themselves as a group from various different backgrounds who have come together to ‘bring back the joy of riding’, and would welcome new members . Ronald McDonald House Cardiff, which opened in 2017, is a purpose-built House adjacent to Noah’s Ark Children’s Hospital. It has 30 en-suite bedrooms to provide free accommodation to families of children being treated at the hospital. There are 14 Ronald McDonald Houses in the UK and in 2017 they helped support over 8,000 families with children in hospital. The Charity, which was founded in 1989, relies on the generosity of supporters and fundraisers, without whom it would be unable to continue its work.